Congratulations to the Bulls and tough luck to the Cheetahs. Fourie du Preez was outstanding to create three tries against the run of play. At least the Cheetahs won two of the three national titles with the 0/19 and 0/21 teams beating the Lions and the Sharks selectively in their finals at Loftus on Saturday. Well done Cheetahs were all proud of you!!! Here an image of Victor Matfield running onto the field in his 5oth game for the Bulls. 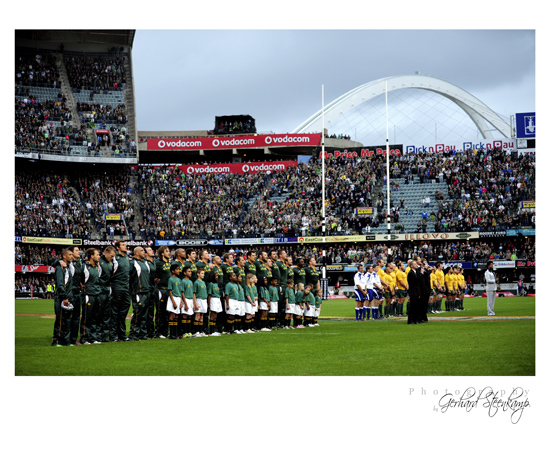 To think the U/19, U/21 and the senior Cheetah teams in the finals in Pretoria on the 31 October 2009. If there is a will there is a way!! An image of myself taking photos at the semi Final on 17 October in Durban during the semi Final between the Cheetahs and the Sharks. I’m busy taking photos of the Cheetahs celebrating their 23-21 win with my Nikon D3 and 10.5mm F2.8 fisheye lens. Photo taking by photographer Howard Cleland. In a Currie Cup match in Kimberley today Griquas keep their Currie Cup Campagne alive by winning the Lions 36 – 31. Here an image of Jonatha Mokuena the Captain of Griquas taking on Earl Rose full back of the Lions. 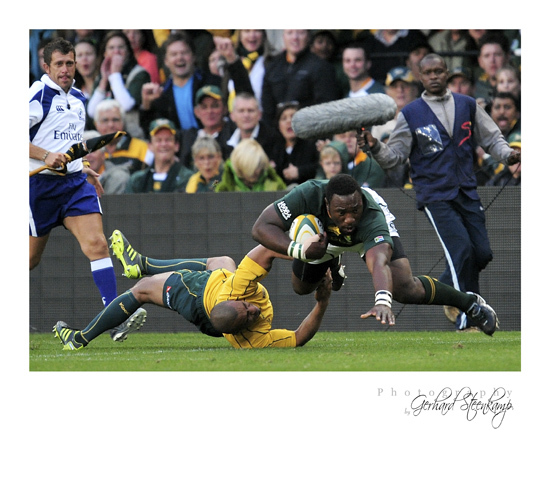 In South Africa the editorial photo market is completely dominated by the big Photo Agencies. The result is a decline in quality images seen in papers and magazines these days. 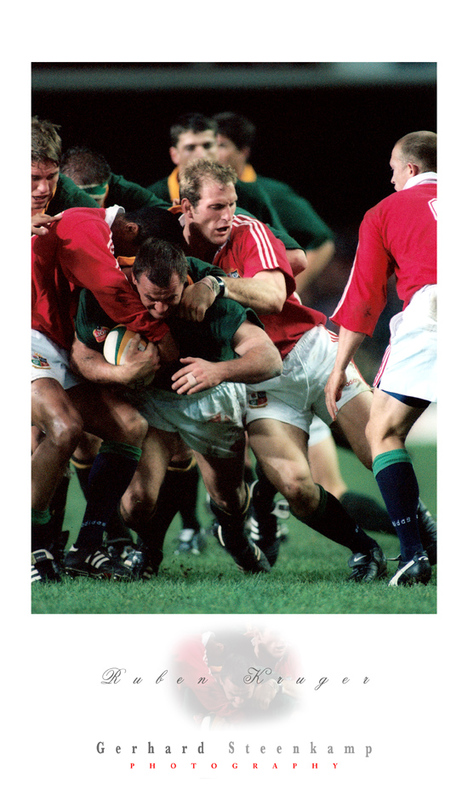 If you had a look in the Sunday papers today 6 September 2009 you can clearly see the difference between the sport images taken of the Springboks vs the Wallabies in Brisbane and the images of the Currie cup games in South Africa. Okay now you will say, but these images were also taken by photographers working for big companies. That is true but the difference overseas and specially in the UK, where i got the most of my work published at the moment, is that they really try there best to support the smaller companies and freelance photographers. That way they keep the image quality high because the bigger companies know if their images ain’t up to standard their work will not be published and the freelance guys know if their work is the best they will get published. Yes as simple as that. I fore see that in the next three years one will really see the decline in image quality that will get published because of this policy of the papers and magazines. The reason for this is that there are still a few good photographers in SA working for the big guys like Duif du Toit and Lefty Shivumba. When they going to finish in a few years time the younger guys won’t be able to deliver the quality because they don’t need to because there is no competition. 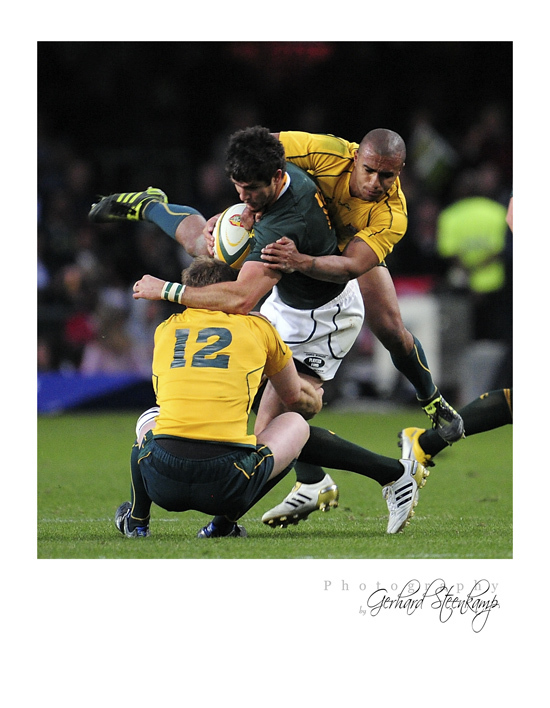 Here two images i took of the game between the Cheetahs and the Lions on Saturday 5 September 2009. I’m not going to say much but if you have seen better images of this game in the papers please let me know because i haven’t seen them. Tertius Carse tackled by Alwyn Hollenbach.